With all the new fangled features and scary technical terms, choosing a right long range rifle scope can be scary for someone unacquainted. In this article I will be explaining the important components of a scope and what considerations a person might have when purchasing a scope. There are a variety of shooting activities that a person might engage in which all have different needs but the key here is to be sure of your purpose and know which features you can compromise on. A scope’s name contains information on its Optical Power. For instance, the Bushnell Tactical 10×40 Rifle Scope tells us that it magnifies the image 10 times when looked through the scope compared to the naked eye. We call this magnification ‘10 power’ and the scope would be called a ‘10 by 40 scope’. If the numbers were ‘10-20×40’ this tells us that the scope is variable power and the magnification can be adjusted from 10x to 20x. The ‘40’ at the end represents the objective lens diameter. More on that later. This is then called a ‘10 to 20 by 40’ scope. The first consideration when picking a rifle scope will be it’s Optical Power. Is the scope fixed power or variable? Should I opt for high power or low power? Hunters will want to use a variable scope and compromise power for a longer field of vision. With greater power comes a narrower field of view. Hunting usually takes place up to 100 yards away from the target. Doing the math, a 3x scope will make the target seem 33 yards away from you while a 10x scope will make it seem 10 yards away. This is a good range to consider as you will also have to search for the animal against deep foliage. As the animal might wander nearer and further away, a variable scope would prove adequate. By this logic, a 3-9×40 scope would be adequate for this specific situation. A target shooter, on the other hand, might pick a higher magnification as they only need to be able to see the target card. Benchrest shooting at 100 yards can warrant a magnification between 10x to 20x. This boils down more to the comfort of a shooter. Moreover, a fixed power scope is simpler to use, more consistent and easier to use. They can potentially be cheaper too and more befitting of a benchrest shooter. Earlier I mentioned the Objective Lens diameter. The main function of a Objective Lens is to let light into the rifle scope. A larger diameter will mean that more light is captured and improve the transmission of light. This could be beneficial if you find yourself shooting in low light situations often. Scopes with high power will need more light coming in, which explains the correlation between objective diameter and power. Of course, there is a trade off which is that scopes with larger objective diameters are heavier and bulkier. This poses problems with transporting the rifle and also makes it difficult to keep a good cheek weld when looking through scope. This could possibly be solved with a cheek riser. A larger objective lens will also require larger mounting rings. With this trade off in mind, you will have to consider whether portability is important for you and whether you can bear that extra weight. 40mm is a fairly common specification and an objective lens larger than this is usually only warranted by magnifications of 15x or more. Crosshairs come in all shapes and sizes – quite literally. There are dot reticles, german reticles and even christmas tree reticles. The most common are the Duplex reticle, the BDC (Ballistic Drop Compensator) reticle, and the Mildot. To quickly summarize, the first is the most common simplest, no-frills option. The second is has lines Which serve as points to aim at during holdover. The Mildot is are complex tactical lens that can be difficult to properly use but are still used for the military aesthetic. An illuminated crosshair can be used for night shoots. The thicker lines will increase the level of contrast between the background and the crosshair and how easy it is to see in low light conditions. The thinner the lens, the finer a distinction can be made hence can improve accuracy. WIth FFP, it basically means that, with a variable power scope, the size of the reticle changes with the level of magnification. The substention – which refers to the amount of space covering the target by the crosshair – remains the same. The converse is true for SFP. While considering so many features, choosing a long range rifle scope can be a terrifyingly daunting task. An easy way to cut through all that complexity is to consider for what purpose you’re using the scope. Target shooting? Varmint hunting? Night shooting? This can help you prioritize the features that are important to you can ignore the ones that aren’t, saving you money in the process. In case you haven’t found out already, sighting a rifle scope correctly is the most important part after you’ve bought a new scope. Yet one of the most basic preconceptions about it is that the best way to sight your newly bought rifle scope is…well..shooting it, right? Not quite! What if I were to tell you that using a couple of easy to learn methods you can save yourself the trouble of wasting ammo for nothing. The most important advantage when trying to sight a gun without shooting first, is saving ammunition for when it really matters. These methods will save you from any unnecessary shoulder recoil. Moreover they’ll give you an excellent reference to start sighting. A perfect sighted rifle ensures you that nothing dangerous is going to happen. Not to you, or anyone. There are 4 ways to sighting your scope without shooting, namely visual, laser, optical and magnetic. We will take a look at each of them and the necessary steps needed. Visual boresighting relies on your patience and discipline. For this, you will need to point your rifle on a steady platform (or a couple of sandbags) to give it stability. It is very important that your rifle remains still during the sighting process. After you remove the bolt, try looking with one eye through the bore centering your target (set at 100 m). Without moving the rifle fine-tune the knobs. The scope crosshairs align themselves with the target point. After zeroing the scope with the specific target point, you’ve got yourself a sighted rifle. Another method, the so-called “mirror method”, involves (as you might have figured out), a mirror. You just need to place the mirror so far enough, that you can see your own reflection while looking through the scope. You need to point your rifle with the barrel straight in it’s own reflection. After that you can adjust the windage adjustment so that it’s lined up with the barrel. Of course, nowadays easier methods have been developed to aid rifle owners spend less time on sighting and more time on shooting. This can be achieved by using a device called a boresighter. It’s an instrument that mounts on the arbor and fits in the muzzle of the riffle. The laser boresight has the advantage of being in line with new technology. It’s a more professional alternative to manual doing the heavy work. One of the main advantages of a laser bore is that it’s far more precise that using your eyes. And while visual boresighting counts for getting you on paper from 100 yards (25 m), the laser bore sighting method will put you much closer to center. Doing that will save you time and money. They come in two shapes: end mounted or bullet shaped. The first is installed at the end of the barrel, activating the laser, while the later goes into the chamber of the gun. In both cases you can notice the laser point, while looking through the scope of the rifle. By carefully rotating the adjustment dials on the scope’s body all you need to do is to centre the crosshairs on the laser point. After that you’l have a perfectly zeroed firearm. Don’t forget to remove the boresighter before firing! An optical boresighter follows the same pattern. Just attach it at the end of the barrel and make sure that the lens is lines up with the scope. While looking through the grid of the lens, you should adjust the crosshairs to match the centre of the grid. Remove the optical boresighter and have a great time hunting! A lesser known, but effective method is using magnetic boresighters; You just need to attach them to the muzzle of your gun using strong magnets. The strong advantage in favor of magnetic boresighters is its versatility, fitting all gauges and calibers, without having to buy or use any additional parts. Moreover it’s an alternative for people who fear inserting anything in the barrel. It’s proven to be very effective when trying to zero a gun after transportation, hard drops, or high usage. In order to choose the best boresighter for your particular rifle, you can consult somebody from your gun retailer’s office. Prices vary from $48 for a Sightmark .22LR Boresight to $150 for the SiteLite Ultra Mag Laser Professional Boresighter (laser bore sighter with a 40 hours autonomy). You want to get yourself a sizable deer, but can’t get close enough without scaring it off? I can’t tell you how many times I’ve been in that situation. The simple solution is to shoot from further away, but how accurate is your shot then? Deer hunting involves patience, time and distance. When these 3 elements come together you will need good visual to execute a fast, clean and humane kill. The scope makes a big difference. Your shot will be accurate with the right scope that has variable magnification. So if you want to make that shot you see the characters do in movies, you need to add a scope or change the one you already have. Here’s my 2 cents on what to look for and how to choose a rifle scope for deer hunting. I’ve once had the perfect shot on a deer, but as I was about to pull the trigger, the sun crept through the trees and a glare bounced off of my scope. Goodbye, deer. It’s simple. If it shines, don’t bother. Your best bet is to get a scope with a matte finish. The whole purpose of getting a scope is to be able to see from far distances. But how far do you have to go, really? I suggest you stick with a 3-9×40 scope. Not sure what the numbers mean? It’s really simple! 3-9x means that you can adjust the scope to magnify your sight anywhere from 3 times to 9 times. The 40 refers to the diameter in millimeters of the objective lens (that’s the lens opposite of the one you’re looking into). 3 to 9 times by 40 is the way you would say 3-9×40. There are scopes that have a stronger magnification, some even going up to 20x. But you’re trying to shoot a deer, not a mouse. Also, think about how you shake as you try to steady your aim. Can you imagine how chaotic that tremor would look through a 20x magnified lens? The slightest movement could throw your entire shot off. Having said this, getting a scope over 10x is a waste of weight, size and price. The first time my dad let me shoot a rifle was through a scope. I had my eye pressed right into the lens and squeezed the trigger. The recoil hammered the eyepiece into my face, leaving a small bruise above my right eye. The standard is 3 to 31⁄2 inches.4 inches is the most you can get for eye relief which is more than enough space to prevent injury from any recoil your rifle kicks at you. Just because you have your cheek on the rifle and can see the lens doesn’t mean you can actually see through the other side. You have to correctly position your face to actually see from the eyepiece through the objective lens. If misaligned, you won’t see a thing. A Mule deers antlers fork in two directions as they grow, splitting again to create more tines (points). Whitetail deers have one main beam from which all other tines emerge. Remember the 3-9×40 we mentioned earlier? Those will have an exit pupil size of 13.3mm (at 3x magnification) to 4.44mm (at 9x magnification). This is the standard pupil size range. There’s a formula to quickly find the exit pupil of a scope, and that is to take the diameter of the objective lens and divide it by the magnification. For example if you have the 3-9×40 scope, and you want to find the exit pupil at 3x magnification, you would take 40 and divide it by 3. Easy, right? If these numbers mean nothing to you or you simply don’t want to deal with the math, you can actually see this by holding the scope out at arm’s length and looking through the lens. You’ll see the small circular light (the exit pupil), and when you adjust the magnification it’ll get bigger (as you zoom out) and smaller (as you zoom in). In short, if the exit pupil is big, you can correctly position your face quicker and easier. If it’s small, you may have to read just your face positioning a few times before getting the best picture through the lens. Let’s get one thing straight. Scopes don’t gather light. Light transmission gives your scope the ability to use the light in the environment. Anything above 90% light transmission is fine, above 95% is great, and above 98% is pristine. However, if you’re on a budget, don’t feel like you’re missing out too much by getting a scope with 90% light transmission. In my opinion, that’s good enough. **If you are planning to hunt at night, check out our reviews on cheap night vision scopes here. Lens Size: The Bigger the Better? A bigger objective lens means more light transmission which means you’d get a better shot, right? Not necessarily. A bigger lens doesn’t just add more light transmission. You have to take into account the size, the weight, and the high mounting required for larger lens. The size of your lens factor into your ability to shoot comfortably. The most common objective lens size is 40 – 44 mm. Do you think the sun will always be shining or the stars will align when you are hunting? Make sure your scope is tough enough to endure the rain and rough terrains. Get a scope made of a one piece solid material and the body tube is O-ring sealed. The scope must still be able to adjust accurately and must NOT leak even when subjected to smashing and trashing. The best advice I can give to you is to not over-complicate things. You can get the scope with the best specs, but if it changes your shot too much from what you’re used to, it won’t be worth it. It’ll feel cluttered, overwhelming, and although you may be able to see clearly, you might not feel the most comfortable. You should start with the standard specs and build up little by little from there. I’ve bolded them in each section, but for easier reading, here they are in bullet form. I suggest you stick with a 3-9×40 scope. The standard eye relief is 3 to 31⁄2 inches. Standard exit pupil range is 13.3mm (at 3x magnification) to 4.44mm (at 9x magnification). Anything above 90% light transmission is fine. The most common objective lens size is 40-44mm. At least 1″ diameter body. The technique of breaking in the barrel of a new rifle is more often than not, disregarded by uninitiated marksmen. Nevertheless, the break-in procedure is a subject that still continues to be a hot debated topics by seasoned sharpshooters. Are you a marksman still on the learning curve? Then you might be eager to find out about the various queries to breaking in a new rifle’s barrel. The first question that’d obviously arise is how to break in a new rifle barrel? The question that inevitably follows is why does the new barrel of a rifle need breaking-in? Is there any scientific procedure that needs to be followed for completing the break-in task? Brand new rifles come with barrels whose steel bores are somewhat uneven characterized by microscopic spots, feathers, and burs that have rough edges. Evening out these blemishes goes a long way in achieving a polished bore. This helps the barrel to propel the ammo with greater speed and accuracy ultimately leading to a better shot. The necessity to abide by the barrel break-in method will depend upon whether your rifle is a custom-made product or mass-produced. Contrary to what you might think, the entire issue of barrel break-in is usually regarded as nebulous and hence misunderstood more often. You will be pleasantly surprised to learn that the steps involved in the whole technique (of barrel break-in) are simple to follow. Almost all shooters are more or less aware of the basic concept. Manuals and leaflets provided with customized as well as factory produced rifles outline the barrel breaking-in procedure. You can browse on the net for websites and portals that offer a step-by-step explanation on how to get started and complete the process. The information may vary in terms of specifics from one website to another. However most techniques recommend you to fire a series of 1, 3, and 5 shots in succession followed by cleaning the barrel after every round of 1, 3, and 5 shots. Take into consideration that shooting every round in rapid succession may lead to the bore of the rifle getting intensely hot. So, you might end up choking the barrel if you persist with your firing. The remedy is to let the bore cool down sufficiently after you’ve fired a round. You can run your fingers over the barrel or poke a finger inside to feel the degree of hotness. Clearing the bore of copper fouling takes quite an effort. Go for another cleaning round by using a copper fouling remover including J-B and Shooter’s Choice. Wrap a strip of Scotch Brite around the cleaning rod and dip it in the solvent. The patching should be thick enough for the rod to move to and fro inside the barrel thoroughly. Never use a naked brush, ensure you’ve made a good patch on it or on the cleaning rod before cleaning. So what is your take-away from the barrel breaking-in process related with a new rifle? Always keep in mind that all this hue and cry about barrel break-in is not just about fulfilling a trend. After all, you want to fire shots with accuracy and to do that you’d have to make sure that the bore stays at all times. Since the bore tends to pick up impurities in the form of copper fouling, you’d need to clean it from time to time. Also the steel bore of a new rifle will have tiny burrs and patches. For filing these, breaking-in the barrel would be necessary. Remember to clean from the barrel end and not the muzzle end. Using a bore scope helps in positioning the cleaning rod concentrically and always opt for a rod made of carbon fiber instead of one made from aluminum or stainless because you want to avoid scratching or abrading the bore or chamber. No one scope is right for the job! Being able to see the sight and target both clearly at the same time is the key to hitting that bull’s eye. With so many jargons ad endless models of scopes floating around, I hope this article will help you understand the terminology and what do the numbers mean on a rifle scope so you can make a better decision when it comes to choosing The One. A rifle scope is also known as a telescopic sight. It is a sighting device that is based on an optical refracting telescope. These devices are used in all types of systems that requires accurate aiming. They are most commonly found on firearms, more particularly rifles. These scopes can help out more than one thing. For one, they relieve the shooter of the worry of lining up the front sight with the rear sight and lose focus on the target while lining up the sights. In this article, I will be writing about what the numbers mean on a rifle scope and their purpose. What are the Magnification Types for Rifle Scopes? The main topic is the numbers in the scope. They measure the magnification power rating of a rifle scope. The magnification refers to how much larger an object will appear when looking through the scope in comparison to how it would look using just the naked eye. The numbers just tells you how powerful the magnification power in a scope. There are two types of rifle scope magnification. The first one is the scope with a fixed magnification, though they’re not as popular as they used to be but they still have some uses. These scopes are set at a specific zoom ratio. The most popular configurations of this type are 4×32, 6×42 and 10×42. The second one is the scope with a variable magnification scope. This type of scope can change the zoom ratio of the image you will see. It’s like adjusting your camera lenses manually before you shot that perfect picture by just rotating that magnification ring at the front of the eyepiece. A Ruger 10/22 rifle with a Mueller APV 4.5-14×40 rifle scope. Many scopes have variable power as shown in the image (Mueller APV 4.5-14×40 rifle scope) above. The first number on the rifle scope connotes its magnification power. For example, 4.5-14×40 means the scope has a magnification power ranging from 4.5x on the low end to 14x on the high end and a variable magnification with a 40mm target lense. To simplify, you will see the image 4.5 to 14 times bigger by just adjusting that magnification ring right in front of the eyepiece. The fourty (40) is the diameter of the objective lens in millimeters. The way you can describe this scope is “four point five to fourteen by forty”. The objective lens is found in the objective bell that is in front of the scope. Do note the larger the objective lens size the brighter the image through the scope appears but larger lenses are heavier and can add a bit more weight the scope. What are the Uses for Different Magnification Scope? Lower magnifying scopes, like with the numbers of 1-5x are best used for close range or quick shooting like turkey hunting. The most common zoom scopes is the 3-9x. 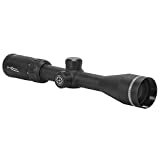 These scopes are good for everyday hunting uses such as deer or prairie dog hunting. Can be use for close range or long range shots with good accuracy. The newer scope models have a magnification of 8 or more; for example the 9-12x scopes, it is pretty much used exclusively for long range target shooting and competition shooting. The ring on the back of a scope indicates what setting is selected. These scopes are popular as they allow the user to choose different power settings. Low power for close range while high power for precision? A good variable scope gives you the best of both worlds. In the fixed rifle scope, the numbers have the same meaning as the variable scope as explained above. The difference is the user cannot adjust the magnification power for a fixed magnification scope. Here is a little tip, when choosing the best long range rifle scope you have to consider, as magnification increases the brightness diminishes. For example a scope at 4x magnification power the image in the scope will be brighter with a 50mm objective lens than with a 32mm lens. Not all scopes have variable magnification. A few scopes have fixed magnification but if you’re planning for a long range hunt or target practice then you better choose the scope that have a variable magnification instead of a fixed one. So there you have it. I have explained the meanings of those numbers in the scope a bit thoroughly. Hopefully you understand this information and make use of this to better buying decisions.